If you are the active type and wanting to get your adrenaline flowing, then Xplor may be the right choice for you. Our little group consisted of a 6- year-old boy, two men nearing 20, and a 30-something woman, who at the time was fighting the flu so this Xplor review may be a little grumpier than usual. 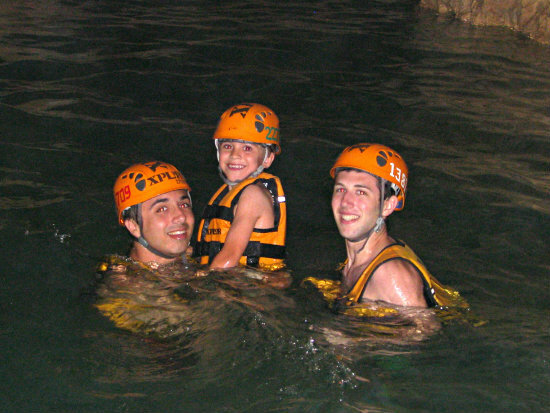 Xplor is an all inclusive park, based around 4 key activities: zip lines, amphibious vehicles, rafts and swimming in the caves. The entire park is planned around the “heart” where you can find the start of all the activities. Keep in mind that regardless of the activity you choose, you will get wet. Wear or bring water shoes, or Teva-like sandals that hold your feet and your don’t mind getting wet. The zip lines run a circuit around the park. Ranging in speed and distance, they will keep you entertained. You can choose to go tandem or on your own, and there is even a water slide thrown in at one point to change it up. 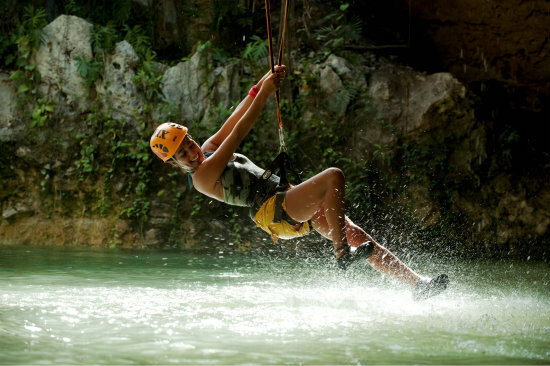 Your final zip line has you zipping through a waterfall and landing in the water. The amphibious vehicles are like tanked up golf carts. They can seat 4 passengers, the driver must be at least 18 years of age (bring ID if your face doesn’t match your age!). The 5km circuit has you driving in and out of caves and water. The only disappointment is that you are only allowed to do this activity once. The river rafting requires a fair bit of effort. You can choose either an individual raft or a 2-person and you are supplied with hand paddles to navigate your way around the underground world. The views, stalagmites and stalactites are impressive, but everyone in our group found the effort required to paddle through the channels was a little bit annoying. The river swim brings you through the underground world again, but with a different perspective as you float through the channels. All the activities are optional, so you can pick and choose what interests you. You do have time to do all 4 if you want to. If you do want to take a break, there are areas around the juice bars with hammocks and swimming pools. The hammocks were tried and tested by both my son and I and are highly recommended for an afternoon nap. The park offers healthy snacks, drinks and a buffet. The main restaurant is not open until 11am, so either plan for breakfast at your hotel before going to the park or make sure you don’t need more than a smoothie for breakfast. The “bars” available offer a variety of fresh fruit and vegetable smoothies. The buffet itself had the most varied salad bar I have seen in ages, but also a choice of meats and grains. Try the “green juice”, it looks a bit scary but it is surprisingly sweet and tasty. All in all, our day was a good one. 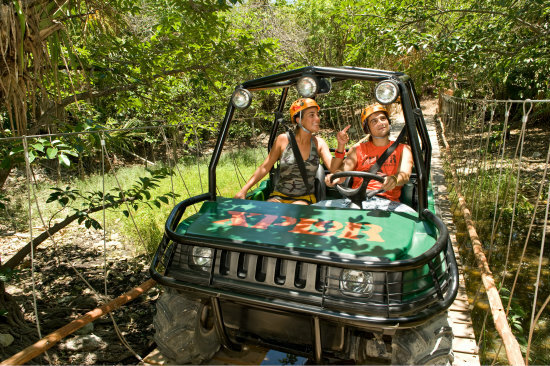 If you are in the Mayan Riviera and want a little adventure and to see the incredible cenotes, Xplor is a great choice. 1 – If you don’t want to spend the day in your swimsuit, wear clothes over your suit and shoes that you don’t mind getting wet. Bring a change of clothes for the end of the day, so you do not have to stay in wet clothes. 2- The park requires you to wear helmets that each have a chip. There are special cameras throughout the park that snap your pictures throughout the day. Great concept and makes for great pictures. However, the price for 1 picture was close to $30US and the price for our group for all pictures was over $140US. If you have a waterproof camera bring it along. They do accept credit cards as payment if you decide you cannot live without these pictures. 3- There are no towels provided so bring your own. 4- There are lockers at the park, and no deposit for the use of the lockers, however, you will get charged if you lose the key. 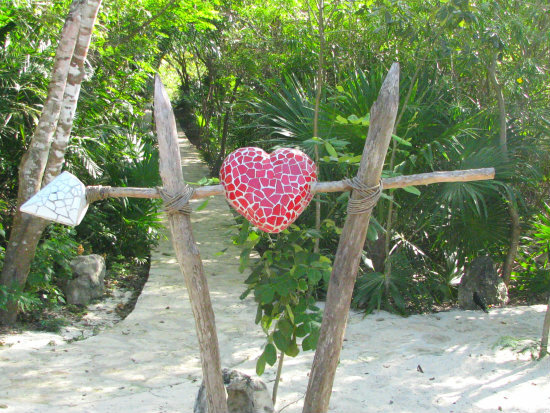 5- If you are in the Playa del Carmen area or even in Puerto Aventuras, book this tour without transportation. You can take a taxi there and back for less money and on your schedule. If you are north of Playa, in Cancun or south of Puerto Aventuras, you may want to book with transportation. The park is open from 9am to 5pm from Monday to Saturday.